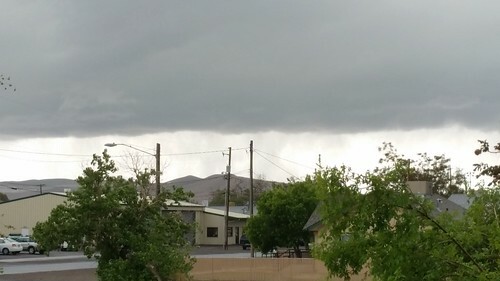 Yesterday afternoon, a line of thunderstorms moved through our part of Nevada. The results were noisy and wet. The clouds shown here collapsed over the mountains to the south a few minutes after I took this photo. Lightning and thunder were almost continuous for maybe thirty minutes or more. These clouds to the east of Fernley looked sufficiently menacing that I thought we were going to see a funnel cloud start poking out of them. 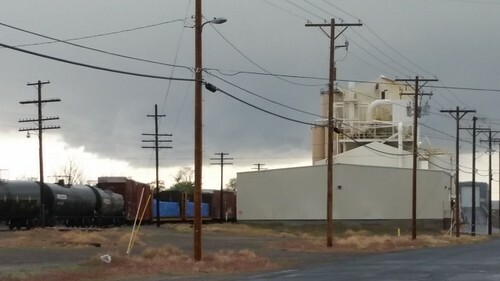 The National Weather Service issued a Severe Thunderstorm Warning, announcing that a powerful storm cell with high winds and heavy rain was moving through Hazen (ten miles east of Fernley). I reassured Lisa that if the NWS actually issued a tornado warning, my phones would both start yelling at me and I'd make sure we got into the most secure room in the house (no exterior windows). It's an unlikely but possible scenario. Heavy rain hit for a while, but nothing compared to hail so heavy in other parts of the county that road crews were out plowing it like slow. Fernley dodged the worst of the weather.